I've been fortunate to have had a pretty long break from playing home auto mechanic, but lately things have been wracking up quite a bit, and for a number of reasons, I had to take action. The most recent project was on my 2002 VW Golf TDI (for more about this car, you can have a look at my old blog, Veggie Golf). I was going to hold off, but the oil building up in the driveway was an indication that I really needed to get on it. Items to fix: Leaking cam seal, timing belt replacement (maintenance interval reached), rear brake rotors and pads, and a few other odds and ends. When I got into the timing belt cover, it was pretty clear the cam seal was doing very little to keep the oil in the engine. This is the lower timing belt compartment after I cleaned it up a lot. 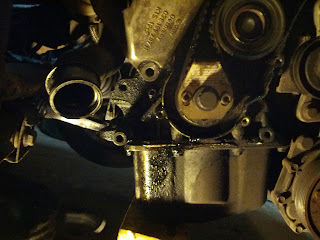 Any doubts were sufficiently quelled when I drained the oil from the crankcase, and got about 2 qts. max out of it. This is dangerously low, especially for a diesel, and even more especially for a turbo equipped engine. Feeling lucky, I went ahead and ordered the parts for the timing belt change, including belts, tensioners, and bolts. Most of the operation went pretty smoothly, although I don't remember ever having so much trouble getting the engine mount bracket in/out. I probably spent about 2 hours screwing around with that thing alone. The new cam seal went in pretty easily. The old one didn't seem damaged, but rather appeared to have come unseated from the camshaft somehow. I didn't spend too much time worrying about it, but I paid close attention to how I put the new one on. All back together now, have to pressure wash the engine bay and then off to the muffler shop to fix the broken flex joint, which is causing exhaust to go into the car. All told, probably about a 10 hour job for me (I'm definitely out of practice).